The City and Guilds 2391-50 level 3 award in the Initial Verification of Electrical Installations is aimed at practising electricians who have not carried out inspection and testing since qualifying or who require some update of training before going on to other City and Guilds qualifications. 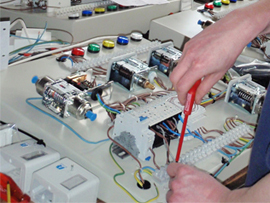 The qualification is also suitable for those with limited experience of initial inspection of electrical installations, such as those entering the industry from other engineering disciplines. Although not mandatory, we strongly recommend that all delegates should already hold the City and Guilds 2382-15 '17th Edition' qualification. To achieve the City and Guilds 2391-50 Inspection and Testing qualification. This qualification replaces the former City and Guilds 2394-01. Presentations and discussion sessions will be mixed with practical work and worked examples to ensure candidates have both the underpinning knowledge and practical skills needed.